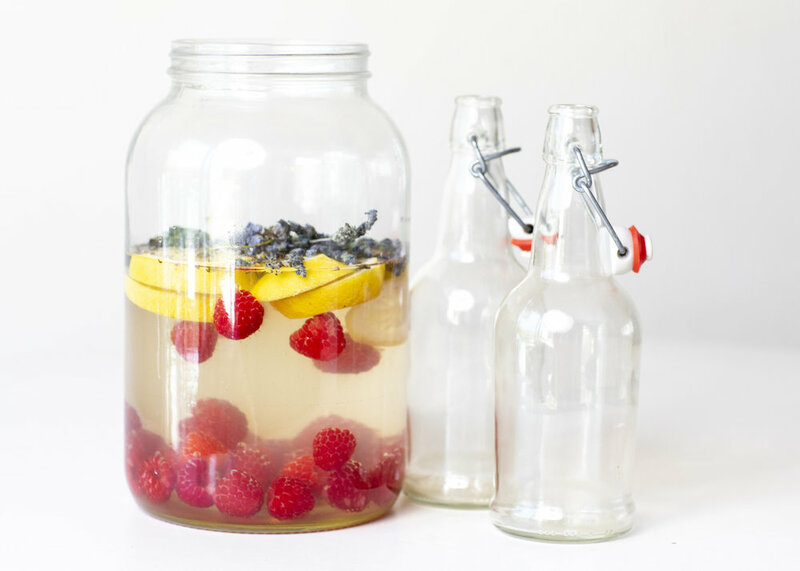 For this recipe, you can use your favorite fruit and herbs to create a delicious, bubbly probiotic beverage (I used raspberries, lavender and mint but any fruit and herbs will do). Although you can buy champagne yeast or make you own ginger bug to aid in the process of fermentation, I never do. I simply allow the wild yeast that is present on the fruit and herbs to aid in the fermentation process. Try it! It's worth the wait and the experiment. 2 cups fresh garden herbs such as lavender, mint, thyme, chamomile, lemon balm, etc. Add all ingredients to a half gallon jar. Stir vigorously with a spoon in a circular motion. Loosely cover with lid or cheesecloth and rubber band around the top of the vessel. Over the next 24-48 hours, vigorously stir the mixture 4 times a day. Tiny bubbles should appear at the top of the liquid. This is a sign that fermentation is taking place. Yay! When the desired level of fermentation is complete (you can achieve this by tasting each time you stir), pour wildcrafted soda through a fine mesh sieve into a vessel large enough to contain the fermented beverage. Next, pour into sterilized bottles. I use flip top glass bottles but you can easily reuse plastic bottles in a pinch. Cap tightly and allow to continue to ferment at room temperature for another 12-24 hours. Test for desired “fizziness” by opening the bottle carefully. Because you are creating natural carbonation through fermentation the contents of the bottle may be extra bubbly and expand or explode upon opening so use caution. Refrigerate when you are happy with the flavor and fizziness.